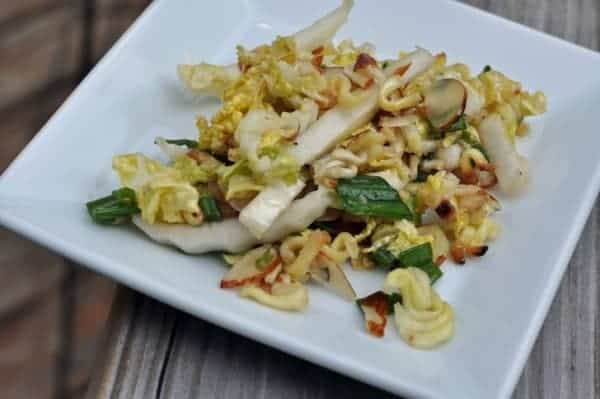 Chinese Crunch Salad = a crisp salad with an oriental dressing is perfect for a summer afternoon. 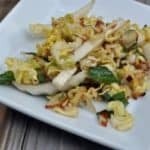 This Chinese Crunch Salad is perfect for a large gathering. Use a large bowl. The Napa when chopped gains volume. The Base: Chop the head of Napa cabbage coarsely. Discard the very end. Place chopped cabbage into the bowl. Chop both the green onion (the green and white portion), and chop onion and place into the bowl. ies. The Crunch; Break up the Ramen noodles and put into a frying pan with 2 tablespoons of butter. Fry them until they are a very light brown, be careful they cook very quickly. Add the slivered almonds until the entire mixture is a light brown. Set aside to cool.